Designers of network algorithms give elegant informal descriptions of the intuition behind their algorithms (see [GHS83, Hu83, MS79, Se82, Se83, ZS80]). Usually, these descriptions are structured as if tasks or subtasks are performed sequentially. From an operational point of view, however, they are performed concurrently. Here, we present a design principle that formally describes how to develop algorithms according to such sequentially phased explanations. The design principle is formulated using Manna and Pnueli's linear time temporal logic [MP83]. 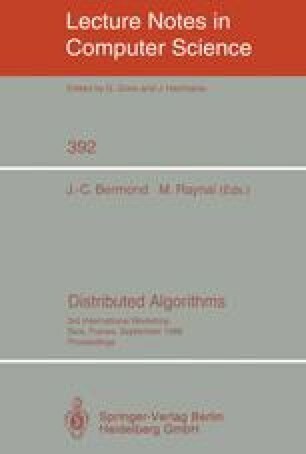 This principle, together with Chandy and Misra's technique [CM88] or Back and Sere's technique [BS89] for designing parallel algorithms, is applicable to large classes of algorithms, such as those for minimum-path, connectivity, network flow, and minimum-weight spanning trees. In particular, the distributed minimum-weight spanning tree algorithm of Gallager, Humblet, and Spira [GHS83] is structured according to our principle.